The papers regularly document the loss of species and habitats in tropical ecosystems, such as the rain forests. However, we are witnessing a similar phenomenon in our own back-yards. The horse chestnut or conker tree (Aesculus hippocastanum) was probably introduced into this country in the late 16th century. It has been extensively used in artificial plantings along roadsides - in creating avenues. In Spring, the statuesque trees are covered with white flowers, sometimes referred to as candles (see picture). Pink and red flowered forms are hybrid types. 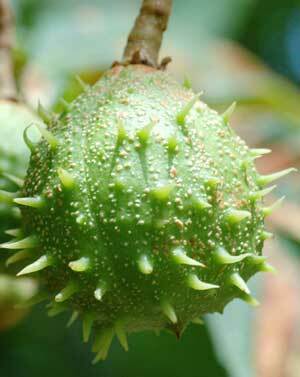 The horse chestnut is recognisable by its distinctive shape; they have arching branches, which turn up at their ends. They also have distinctive palmate (hand shaped) leaves with prominent veins - see https://www.woodlands.co.uk/blog/tree-identification/horse-chestnut/. Another feature that is characteristic to the tree is its seed – the conker, which is formed in the autumn within the prickly fruit. At one time, these were used as an animal feed. The wood of the tree is of little economic value. Horse chestnuts were often planted in by local authorities, in part because of their impressive appearance but also because of their low incidence of fungal disease and pests. However, they are subject to attack by one particular fungus and also a moth. The fungus that attacks the tree is called Guignardia aesculi or the leaf blotch fungus. 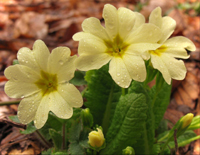 Reddish brown patches appear on the leaves (from July onwards), particularly at the tips and edges of the leaflets. A closer look will reveal small black pimples, which are the fruiting bodies of the fungus. Infection may result in some of the leaves falling early, but it does not usually result in significant damage to the tree. 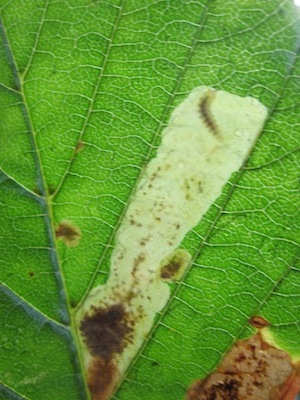 However, infection of the horse chestnut with the larvae / caterpillars of a small moth (Cameraria ohridella) has a much greater impact. These caterpillars feed on the tissue between the upper and lower surfaces of the leaf, producing ‘mines’. These are tunnels through the leaf where the tissue has been eaten. If the leaf is held up to the light, such tunnels (if fresh) may appear translucent. The loss of the green photosynthetic tissue eventually results in the death of the leaf and early leaf fall. The caterpillars pass through several stages (instars) when the skin is shed and growth occurs. After about 4 weeks (in the summer), they pupate and emerge some 2 weeks later (again, in the summer months) as the adult moth. And the cycle of egg laying and hatching to caterpillar etc. begins again. Many types of tree are infected by leaf miners, but these do not (usually) have dramatic effects. However, the horse chestnut can suffer very severe infestations with these moth caterpillars so that all the leaves fall prematurely; the tree is basically defoliated. Conkers may be reduced in size. The moth seems to flourish in very dry conditions. Outbreaks have occurred in the UK in recent years. The first was noted in Wimbledon in 2002, but it has since been seen in many places from North Norfolk to Newport in Wales. The moth is an invasive species, and is thought to have originated in the Balkans ('home' of the horse chestnut).